I’ve lived in Bangalore for a year. 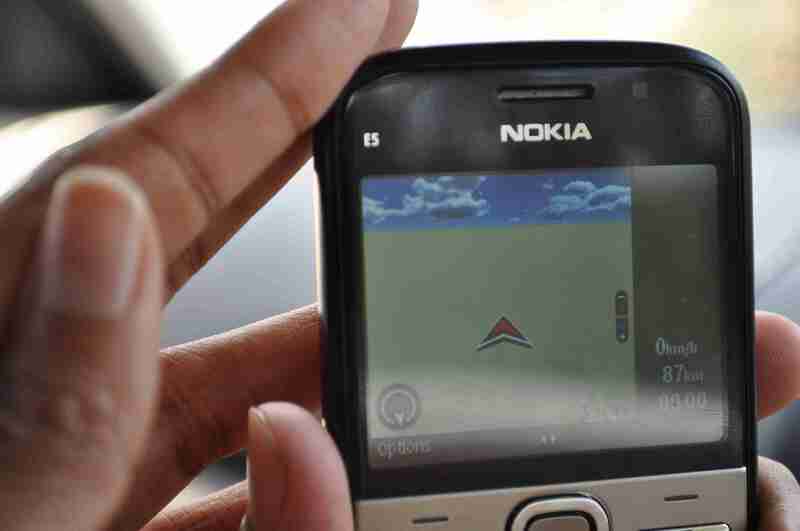 Yet I’ve never come across this place called ‘Oklipura’. Usually crafts are made in villages and I had no clue how to find them. I just knew they were in Oklipura (purely based on some reference in a book), but the address was not known. So I walked around the neighborhood for about an hour and finally was directed to the right place by the local dhobi (launderer). 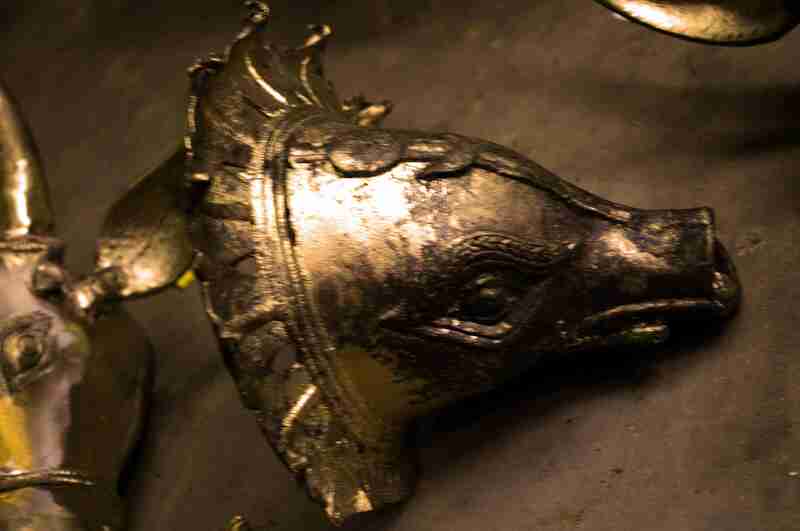 There I met a very enterprising lady, the daughter of the master craftsman who explained the details. For generations they have been catering to their clients in South Karnataka. Dakshin Kannada district is known for its unique culture. Bhuta Kola or Holy Spirit worship is a stylised form of ritual dance of the spirit impersonator. 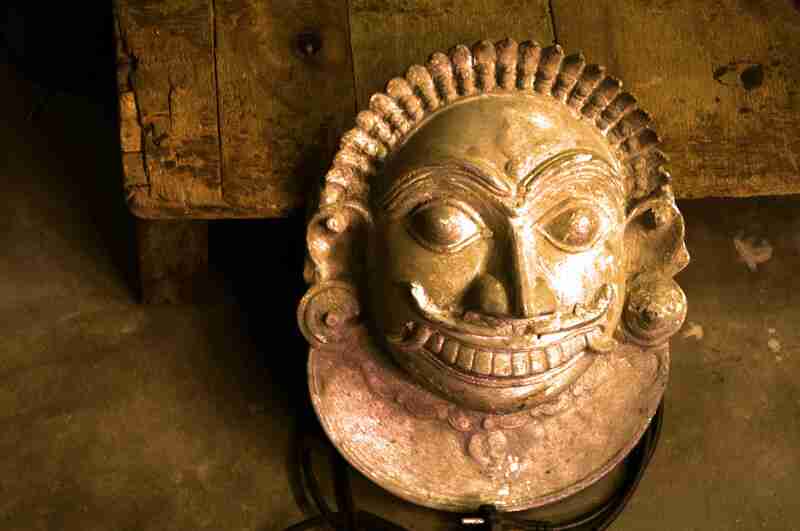 It is quite similar to ‘Theyyam’, an art form from the Malabar region of Kerala. An interesting form of dance-ritual called ‘Yakshagana’ a dance-drama creating the world of divine and super human beings with all the paraphernalia of costumes, make ups, music, dance and dialogue is practised. A mask of the demon God is worn during this ritual. 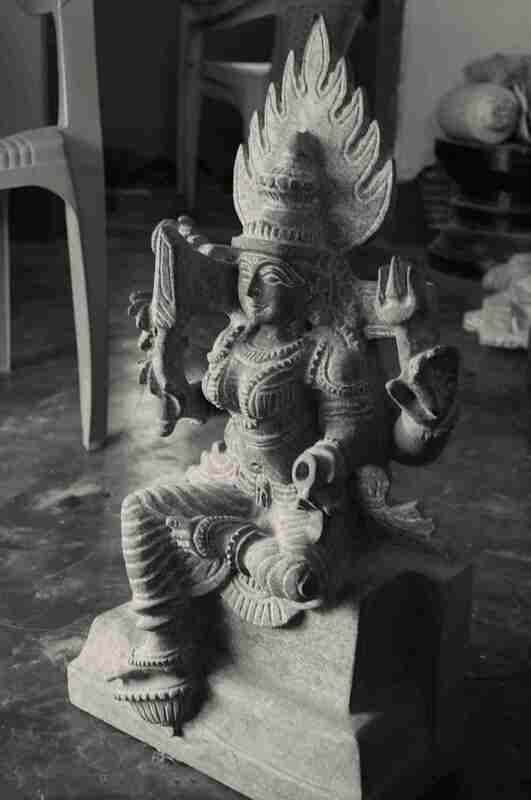 The sculptures are made in various sizes for different purposes. For sake of puja at home, sizes smaller than a palm size are only used. 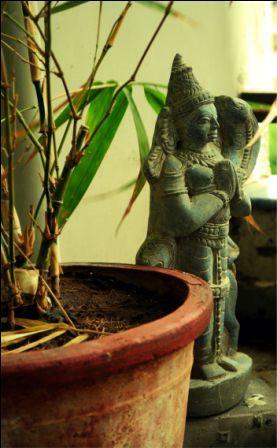 Any size bigger than a size of a palm are either worshipped in temples or used as decorative pieces at home. 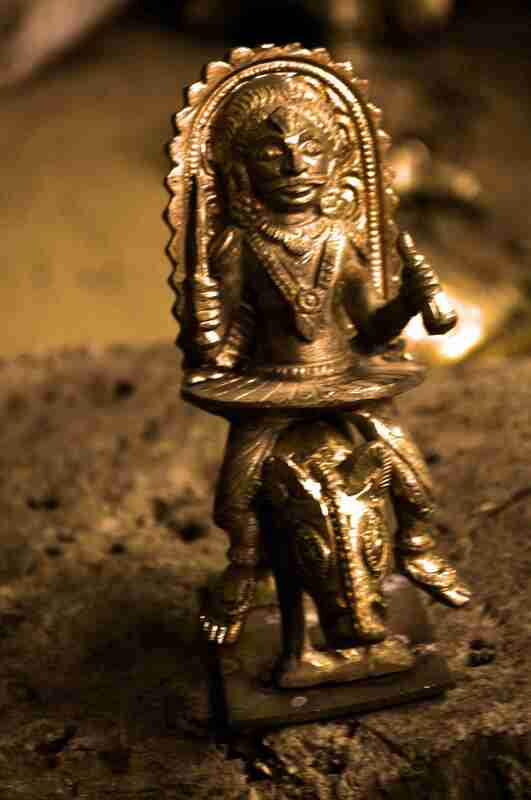 Panch Dhatu, an alloy of five metals or Brass is used to make these figures. 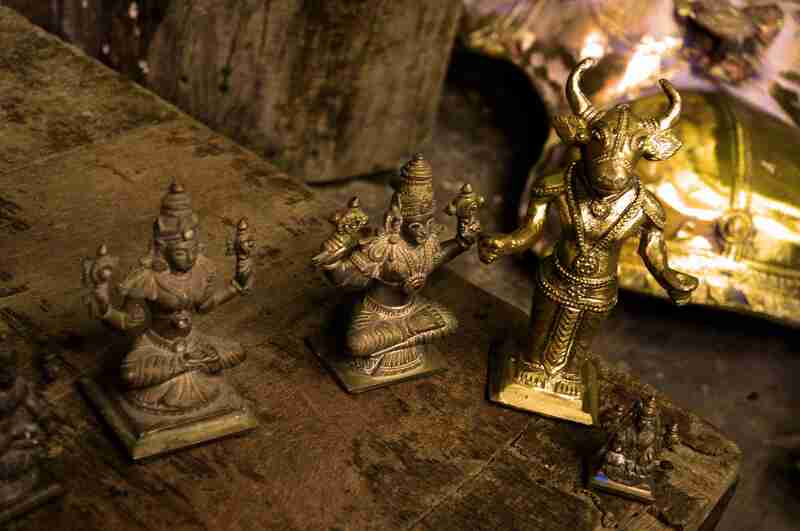 Spirits are classified as animisitic or they represent Puranic Gods, Cultural heroes or local characters. 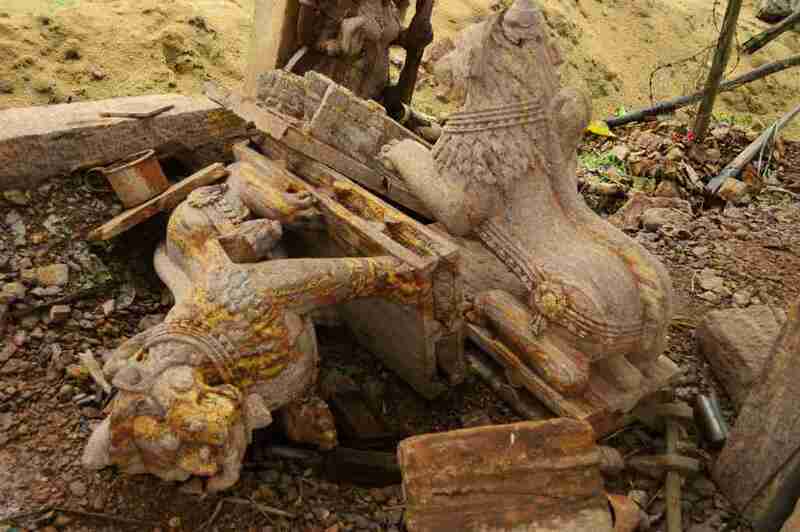 Mahishasura, the bull demon is worshipped. 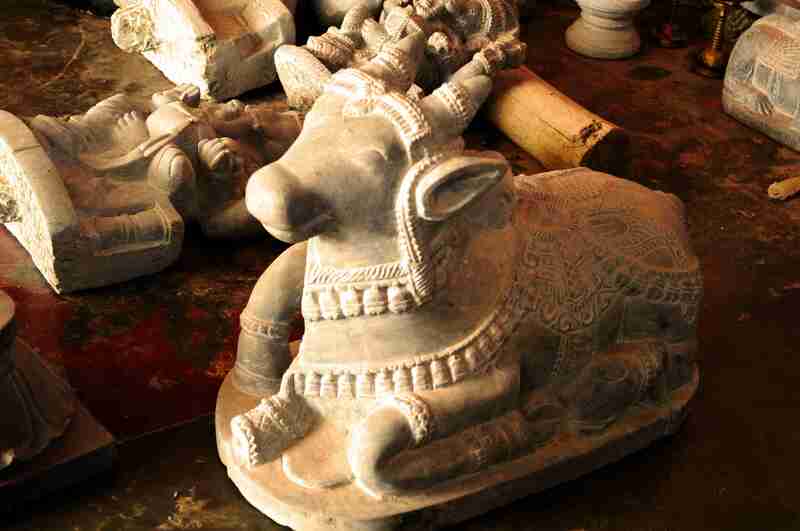 Varaha, an avatar of Vishnu where he was a boar is also worshipped. 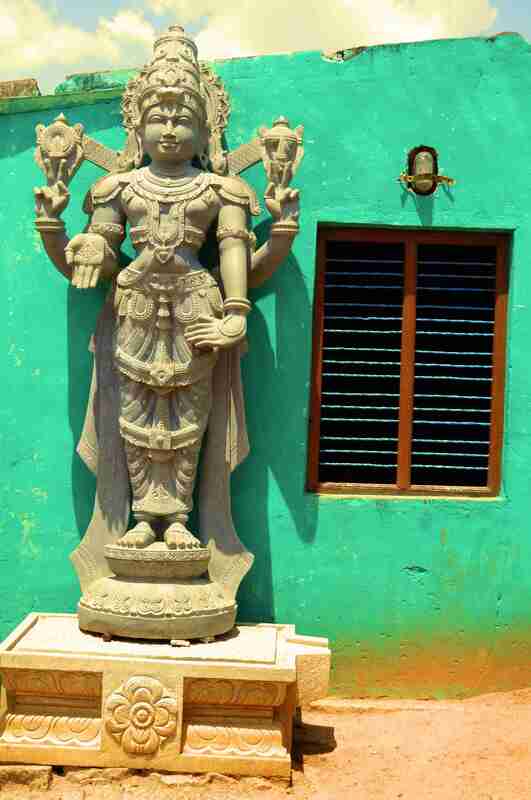 Goddess Lakshmi is worshipped in a different form here. 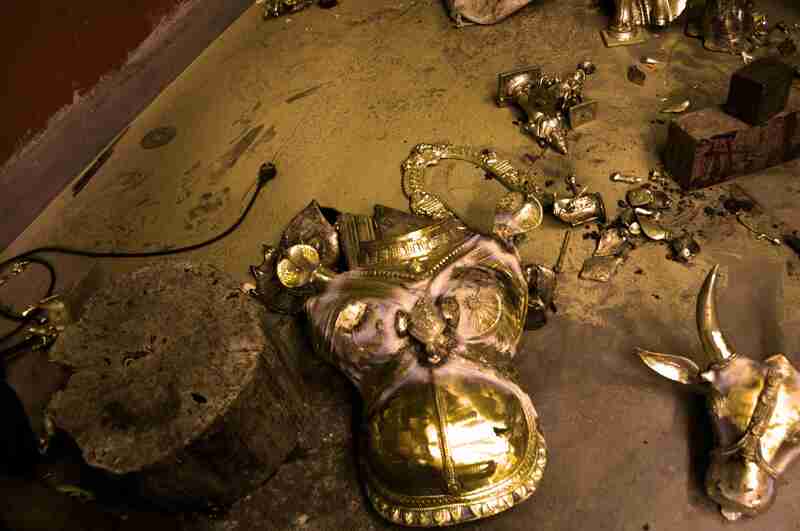 The picture shows the top part of the body of Goddess Lakshmi. I left the workshop with a fascinating fact told by the lady. 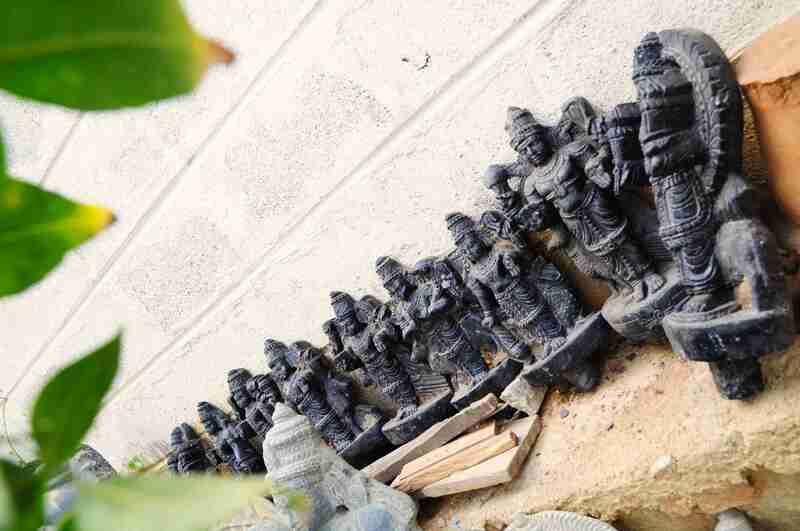 She said that the none of these Gods are worshipped by people who make them. And its been that way for generations. My first day in Bhubaneswar happened to be very rainy indeed. Such a dampener when you have so much to do in such little time. Thanks to Dr.Gadanayak’s(Director, school of sculpture) advice, I had a fairly reasonable list of locations for the crafts I wanted to visit. 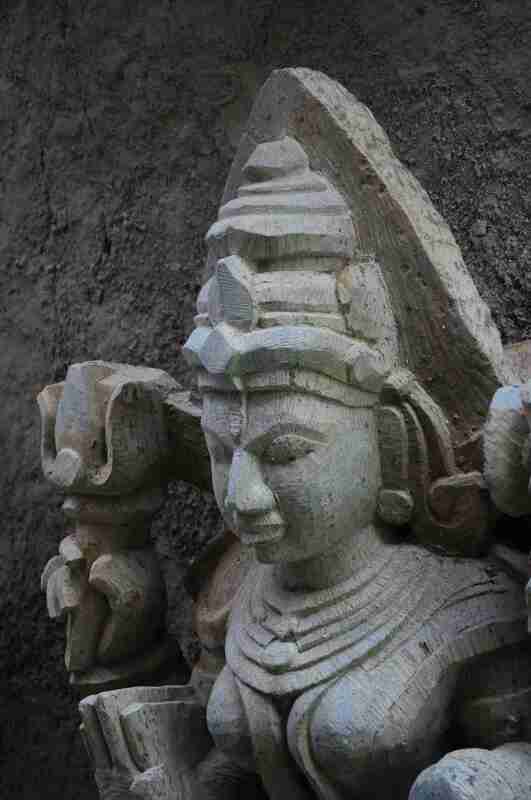 The closest craft was stone carving, so Girish (my friend) and I were off to explore it in the maddening rain! 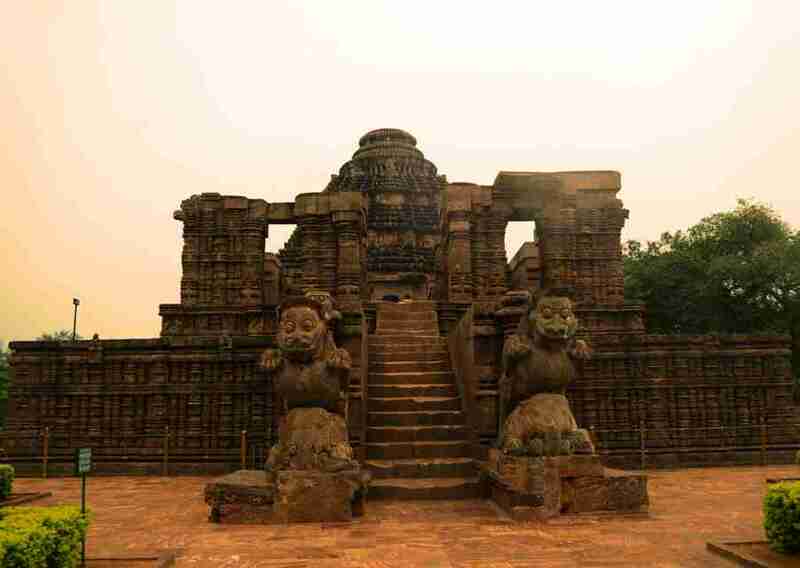 The initial experience was mind-blowing and this was even before I had visited the Konark temple. 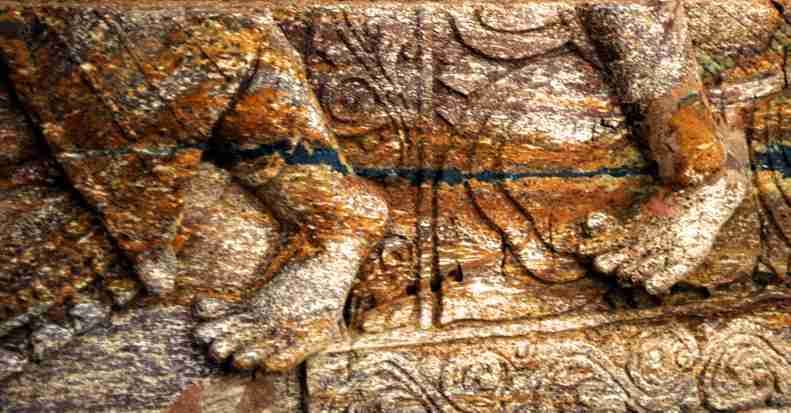 Orissa’s temples are monuments of beauty, every bit of it sculpted by the ancestors of these gifted men, the worshippers of Vishwakarma, the divine architect of the world. 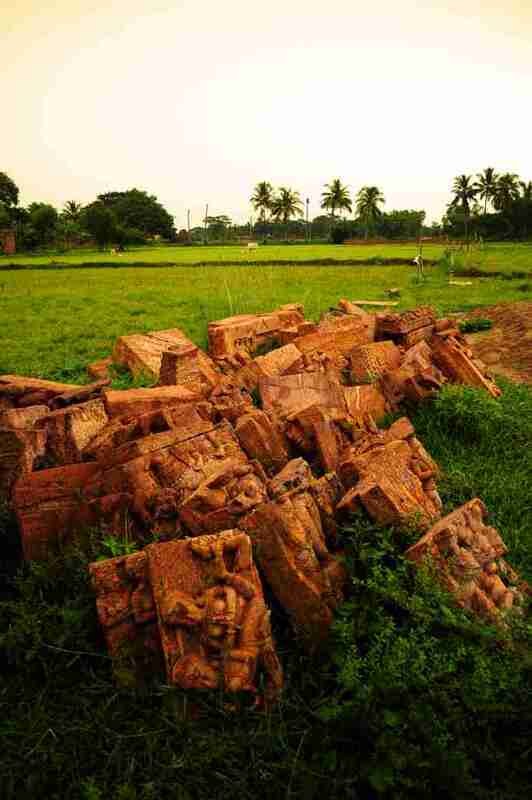 The temples are made of sandstone (sanapattar, as it is locally called) and have a reddish-pink sheen. 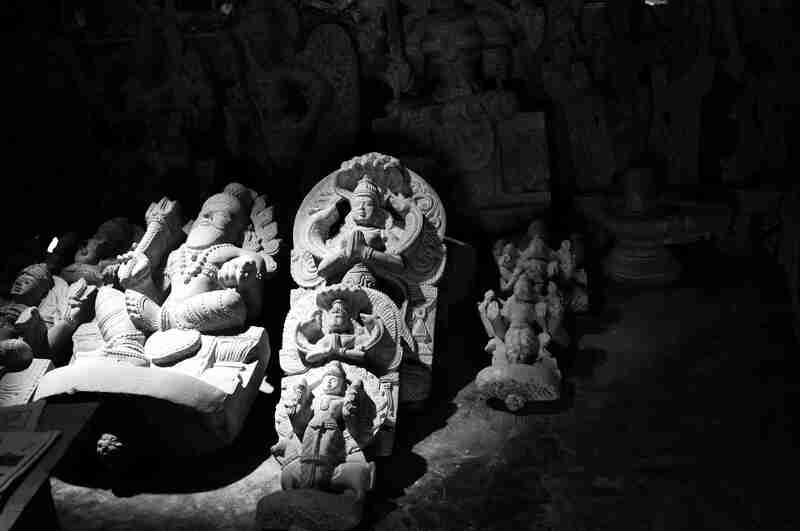 The first stop was a well established set up owned and run by a master sculptor Dr. Sudarshan Sahu. Though we didn’t get to meet him, we were generously allowed a tour of his premises. 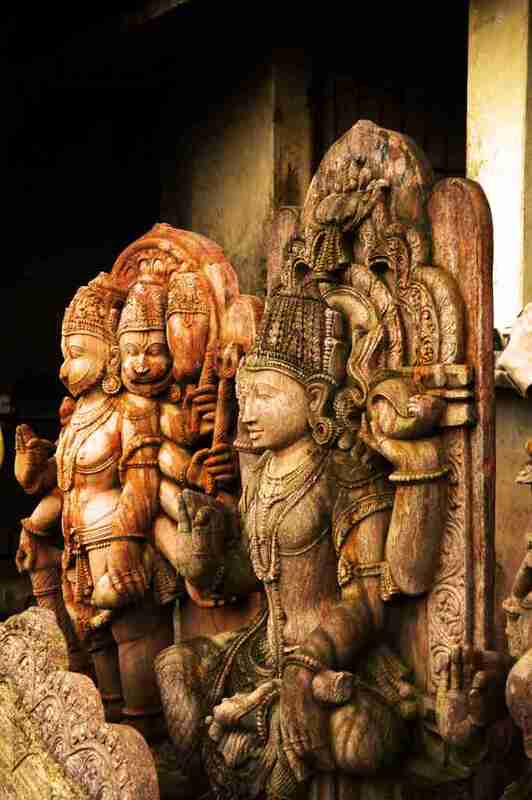 The craftsmen working under him were patiently creating the works of art. 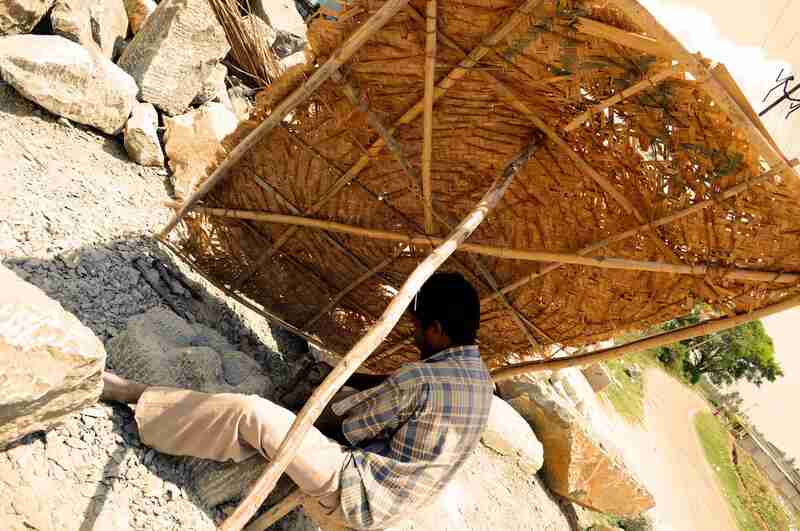 One of them, Murlidar explained that Orissa is rich in various indigenous varieties of stone. Anything from the super soft soapstone to the hard granite is available here. 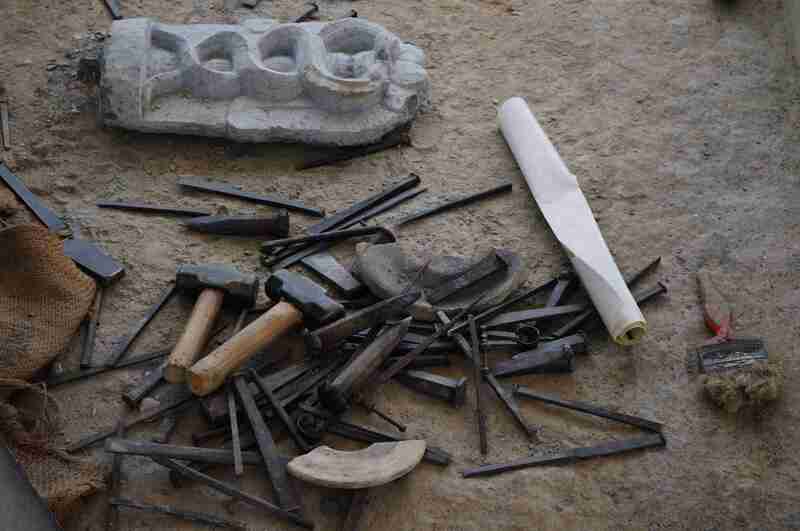 Very simple tools like chisels and hammers are used to sculpt these beauties. 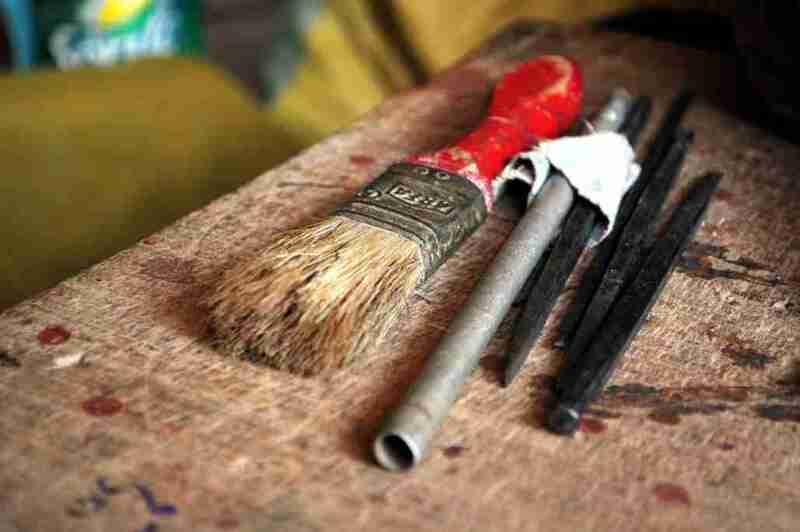 The detailing achieved using these simple tools..
Our next stop was a small workshop on the way to Pipli. 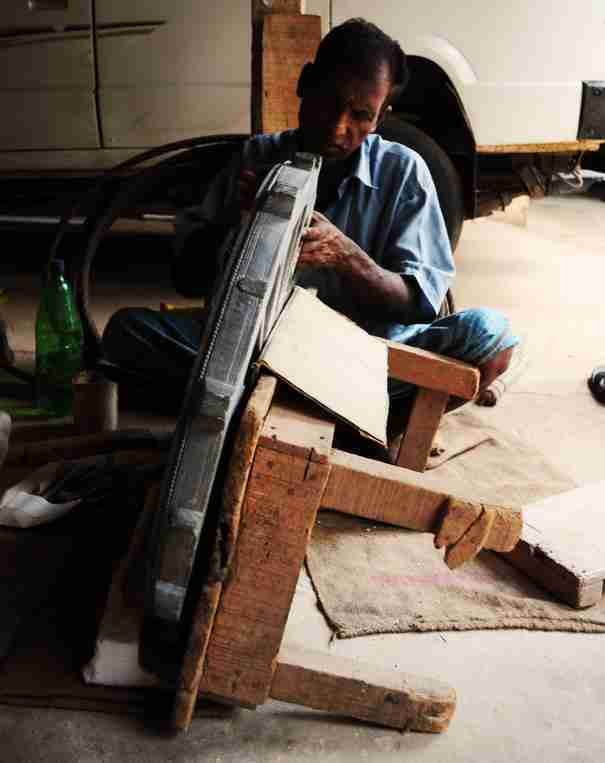 The entire Bhubaneswar-Pipli road is dotted with such small workshops. We decided to take a random stop at one of them and we were not disappointed. 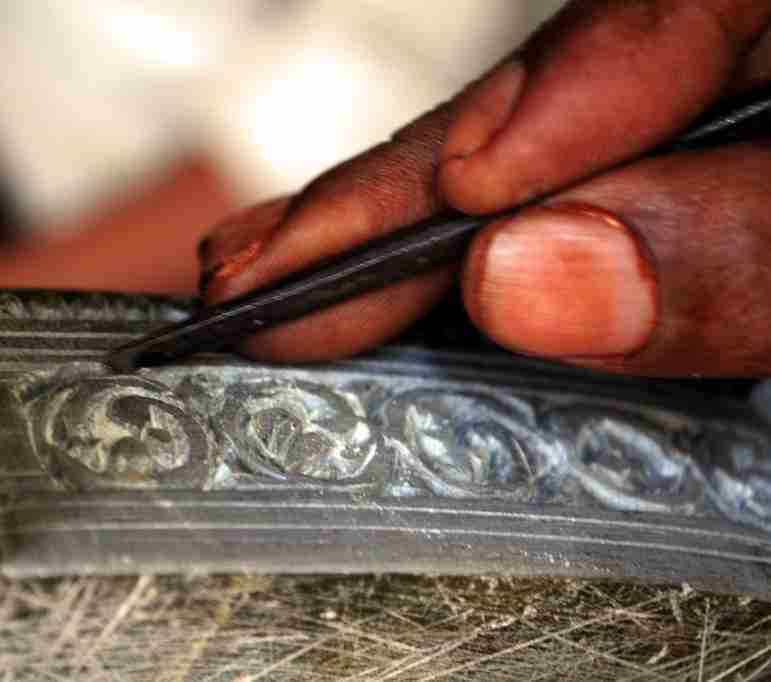 I met Rasamani Maharana, a master craftsman who runs a training school there. The rain soaked sculptures in contrast to the lush green of the surroundings was the first thing that hit me here. 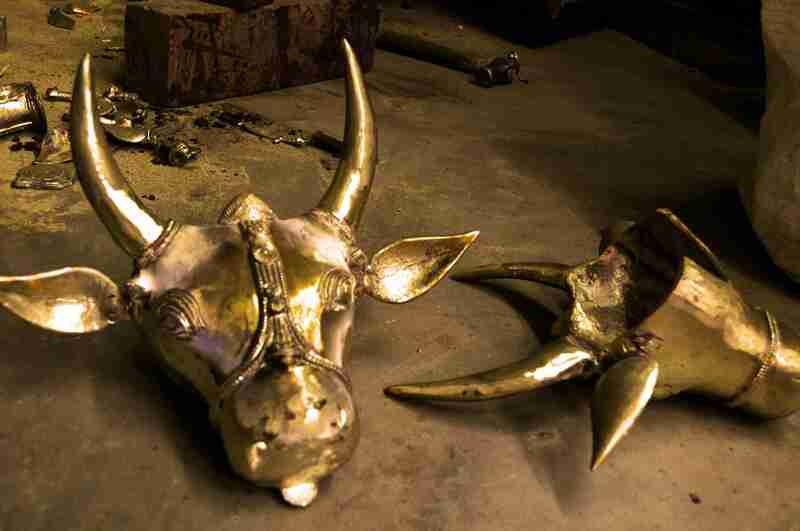 Here are a few designs..
Signature sculpture from Orissa. 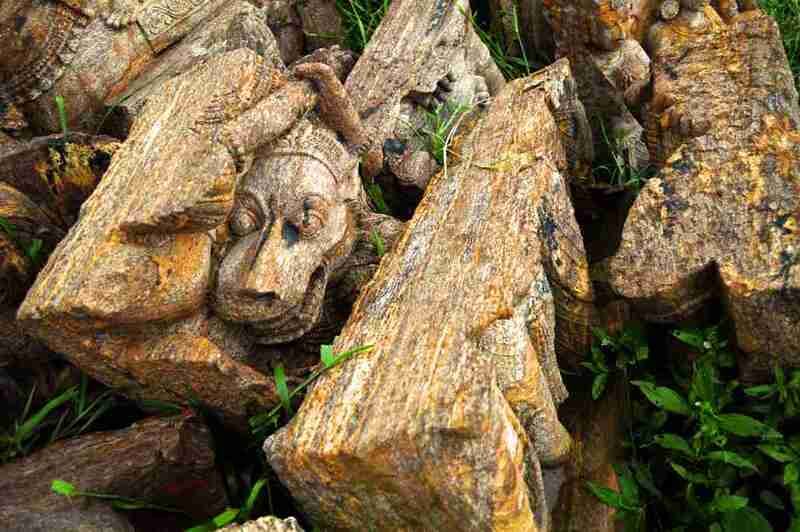 A lion sculpture guards the gate in every temple. It is a symbol of triumph and victory. Note the detailing on the waist band. I would have loved to stay back to hear the constant chiseling, taking in the lush surroundings and admiring the sculptures. Another burst of rain and I had to leave. 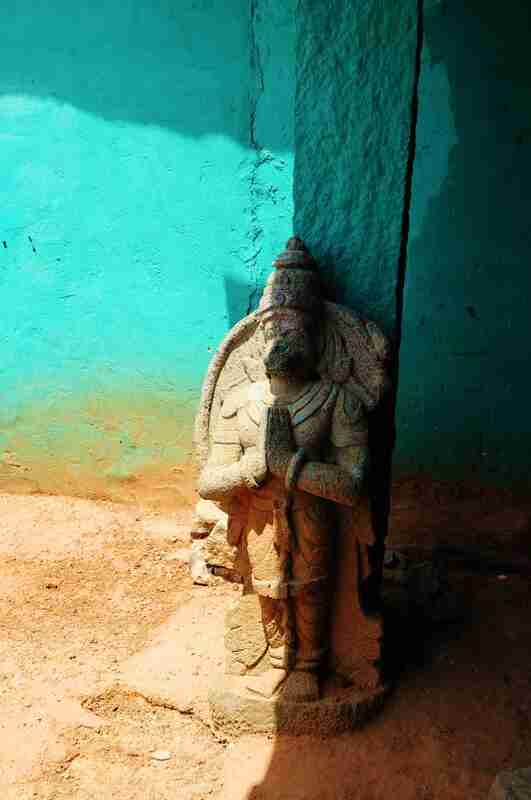 Please click here for more photos of my Orissa trip.